Tamil National Alliance(TNA) and opposition leader R.Sampanthan is currently engaged in negotiations with Northern province chief minister C.V. Wigneswaran to bring about a “Settlement” Between warring factions of the TNA. TNA Jaffna district MP. Sivagnanam Sreetharan and Mannar Dist MP Charles Nimalarajan have exerted pressure on Sampanthan to talk to Wigneswaran and arrive at an undertanding and truce instead of going ahead with moves to oust Wigneswaran as chief minister. Both MP”s have the backing of influential pro-LTTE elements in the Tamil Diaspora and have been urged by those sections to prevent the “Diaspora Darling” Wigneswaran from being removed as chief minister. Pro-LTTE Diaspora elements are also strongly supporting a motley group of organizations, parties & individuals to mount a coordinated campaign to resist the removal of Wigneswaran. While the Ilanklai Thamil Arasuk Katchi(ITAK)members of the Northern provincial council with the exception of Ms. Ananthy Sasitharan are opposed to Wigneswaran continuing as chief minister , the other constituent parties of the TNA namely the PLOTE, EPRLF and TELO are supportive of Wigneswaran in this matter. The TNA obtained 30 of 38 seats in the NPC in 2013. Of these the pro – Wigneswaran and anti-Wigneswaran sides have 15 members each.The majority of ITAK Councillors and Transport minister Deneeswaran elected from the TELO are in the camp opposed to Wigneswaran. The PLOTE, EPRLF and Majority of TELO along with Ms. Sasitharan and Mr. Wigeswaran are in the pro – Wigneswaran camp. Both of them were elected from the ITAK in 2013. 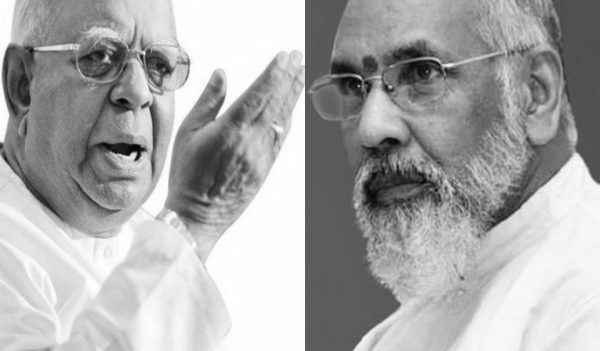 It is against this backdrop of a potential showdown between Pro and anti Wigneswaran sections within and outside the TNA that pressure is being mounted on Sampanthan to reach a Truce with Wigneswaran. Sampanthan is being “advised” that if the move to remove Wigneswaran as chief minister continues the fragmentation of the TNA would be inevitable. This is likely to affect the role played by the TNA in positive exercises like the making of a new Constitution. If the Sampanthan – Wigneswaran talks succeed then a compromise is likely to be reached where the ITAK led initiative to remove Wigneswaran as chief minister is stopped. Wigneswaran will continue to retain the three ministers in his board of ministers . Only the resignation of Agriculture minister Angaranesan will be accepted. His place will be filled by T.Raviharan from Mullaitheevu. Of the five Northern districts, Mullaitheevu went unrepresented in the earlier board of four minsters. Raviharan who is from the EPRLF also has the backing of pro _LTTE groups in the Diaspora. There will also be a stop to demonstrations and Hartals in support of Wigneswaran. Though Sampanthan is likely to reach a compromise the younger ITAK councillors are not ready to accept a truce so far. Likewise sections in the pro-Wigneswaran camp who see this clash as a golden opportunity to split the TNA will also oppose it. In this context the final outcome of the Sampanthan -Wigneswaran talks is yet in the realm of the unknown.